After the Via Dolorosa Grotto we went back to Lucban proper to buy some souvenir food like their famous Lucban Longganisa. When we arrived at the town proper, we saw a vendor selling kakanin (goodies/tidbits/sweetmeats/). 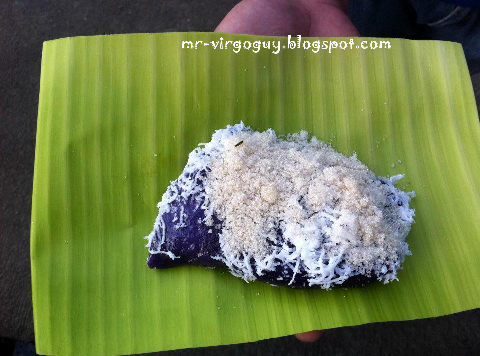 We bought rice cake called puto bumbong. Afterwards we then walked to nearby souvenir stores that sells pasalubong like sweets, and Lucban longganisa. You have two options for buying longganisa, small or large (sorry no medium size, hehe). We also bought sweets in several stores. I noticed in Lucban that people coming from a store hold paper bags instead of plastic. The reason? The town strictly implement their "Zero Plastic Policy". 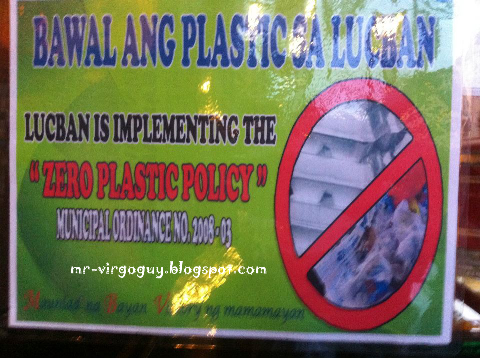 It's a Municipal Ordinance 2008-03 entitled “An Ordinance Regulating the Use and Sale of Plastic Bags/Plastic Cellophane (Polyethylene) as Packing/Bagging Materials and Institutionalizing the Use of Biodegradable Containers within the Municipality of Lucban, Quezon.” The picture you see in the beginning of this post is displayed in one of the souvenir stores. I actually admire people following this policy because they are really concern in their environment. I hope that other cities and towns will follow this policy, it will help our environment big time. We now decided to go home, and took the SLEX (South Luzon Expressway) route because the National Highway road does not have light posts so it'll be hard for us. Before going to expressway, we stop by at a house of David's relatives for a moment. We reached Manila at around 11 PM. David and Ruth alighted from the car in Cubao while Argelito accompanied Catherine to her home. Me and Bossing decided to sleep at Momo's house. That's a wrap. The one day adventure that took four posts to finish. I hope you enjoy reading these as I do. You may view the pictures I took during the escapade here. I hope I will have another adventure to post in my blog. Happy reading! That kakanin look delish. I suddenly get hungry. Anyway, pimindot na ako agad bago pa hindi ko ma-access ulit pindotan mo :-D. Kumusta pala?